It has half brown/half white rice, stewed baby carrots, and chopped cucumber kim chee. I used one of my “Whale of a Punch” scrapbooking punches for the stars. 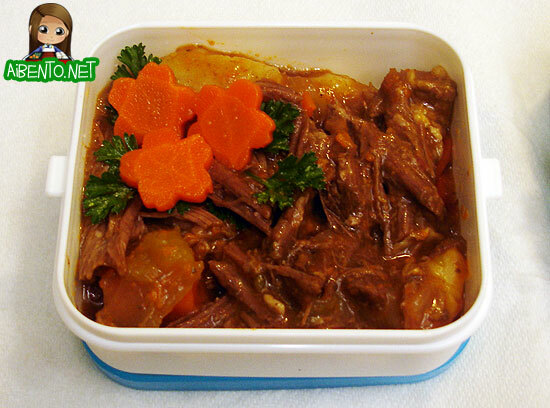 The bottom layer contains the stew. I’m so demented with bento obsession that I actually took the piece of carrot out, washed it, sliced it, and made them into sakura carrot flowers. The extras I shoved underneath the stew for him to eat. 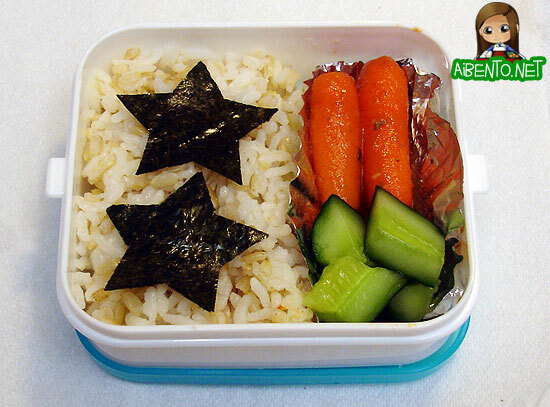 The parsley was really cheap at the market and is a really handy decoration for bento. I’m an instant parsley fan! Tomorrow will be a really bad day in points… damn restaurants!